Israeli soldiers carry the body of a Palestinian, who Israeli police and army said was shot by a policeman, after he stabbed a soldier, in the West Bank old city of Hebron, Oct. 29, 2015. Israeli forces shot and killed two Palestinians, including one who stabbed a soldier, the latest in a string of clashes in the volatile and divided West Bank city of Hebron. While protests and attacks in Jerusalem have eased, tensions have flared in Hebron, where near-daily clashes pit youths against Israeli soldiers enforcing the decades-long occupation of the West Bank and the presence of Israeli settlers has kept tempers hot. In one attack on Thursday, a 23-year-old Palestinian man stabbed and lightly wounded an Israeli border guard near a shrine in Hebron known to Jews as the Cave of the Patriarchs and to Muslims as the Ibrahimi Mosque. The man then attempted to stab another security officer before Israeli forces shot and killed him. In the second incident, a 19-year-old Palestinian allegedly tried to stab an Israeli soldier in Hebron. A Palestinian boy uses a sling to hurl stones towards Israeli troops during clashes in the West Bank city of Hebron, Oct. 29, 2015. More than a month of Palestinian violence has killed 11 Israelis and 58 Palestinians. Israel said most of the Palestinians were killed while attacking or attempting to shoot or stab Israeli civilians, police, or soldiers. The violence erupted when rumors swept through Palestinian neighborhoods that Israeli was planning to take over an east Jerusalem holy site sacred to both Muslims and Jews. Israel has constantly denied the rumors. The U.N. High Commissioner of Human Rights on Wednesday said the violence will "draw closer to a catastrophe" if it is not stopped immediately. "People who fear each other, who fear the corresponding motives of each other and so fear the future. Fears that, unless checked, quickly become in time so raw, so stark... many considerations of humanity will become secondary," said Zeid Ra'ad al-Hussein. 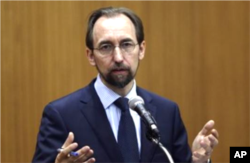 FILE - U.N. High Commissioner for Human Rights Zeid Ra’ad Al Hussein . Speaking at the Human Rights Council in Geneva, Hussein laid blame for the violence on both sides -- accusing Israel of excessive use of force against the Palestinians along with violence carried out by Jewish settlers. But he said the Palestinian knifings, shootings and car attacks against Israelis must stop as well as the incitement by Palestinian authorities. Palestinian President Mahmoud Abbas also addressed the Human Rights Council, calling on the world community to set up what he calls a "special regime" to protect his people from the Israelis. Israel's foreign ministry dismissed Abbas' comments as more "propaganda and incitement" instead of a desire to hold talks. U.S. Secretary of State John Kerry, who met separately last week with the Israeli and Palestinian leaders, has also avoided directly blaming one side or the other for the strife. Kerry said in Washington Wednesday that both sides have to show "firm and creative leadership." "It is absolutely vital for Israel to take steps that empower Palestinian leaders to improve economic opportunities and the quality of life for their people on a day-to-day basis," he said. "And it is equally important for Palestinian leaders to cease the incitement of violence and to offer something more than rhetoric. Instead, propose solutions that will contribute in a real way... to the improvement of life... and to the safety and security of Israelis," Kerry added.